Please note that the Motor vibration effect has been deleted from the batch of Aug 20th. 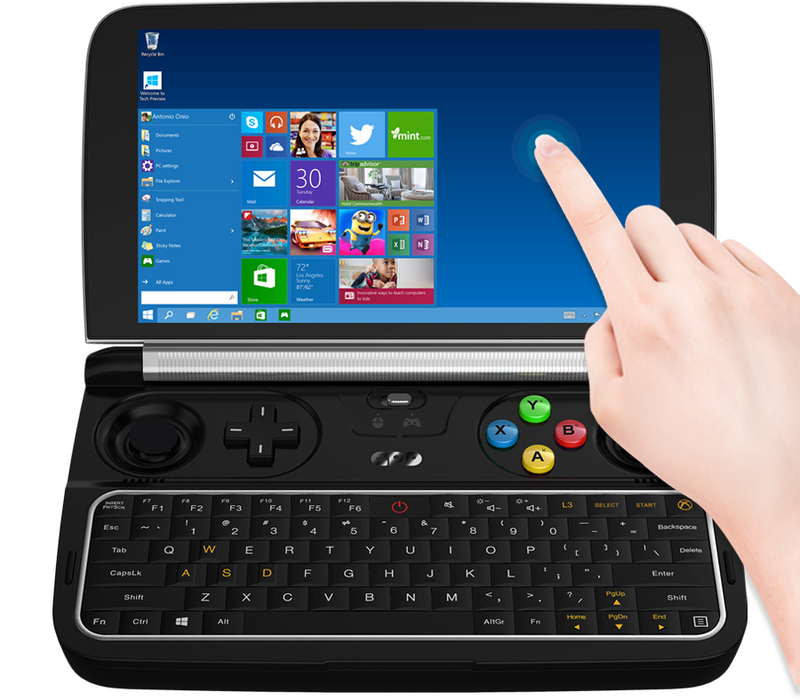 What is GPD WIN 2 ? Owning a portable handheld game console capable of running AAA games such as GTA5, has always been the dream of many gamers. But even the best handheld consoles on the market like the PSP and PSV struggle to run these games. Better game console performance normally requires a device that is sizable enough to have sufficient processing power and is able to withstand long battery use and overheating. 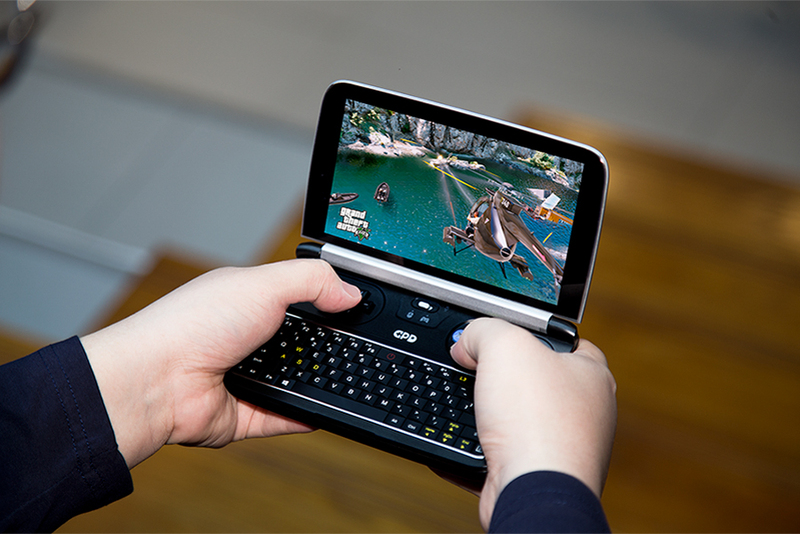 Our GPD WIN 2 comes in compact form but doesn’t sacrifice game play experience. GPD WIN 2`s lightweight design and heavyweight hardware processing power allows it to achieve ultimate compactness with minimum heat output and long battery life. 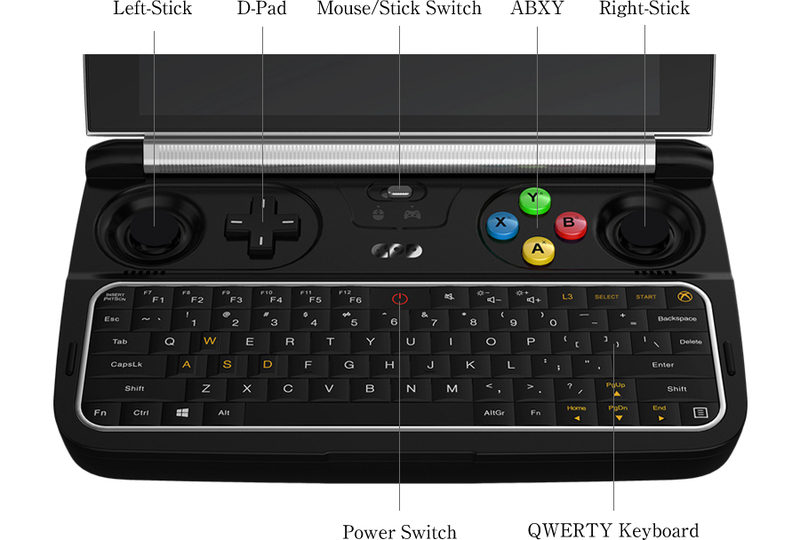 At GPD, we are committed to develope a handheld game console that can run AAA games smoothly. At the same time, the heat-dissipation, power consumption, device weight, portability, battery-life and other factors will also be taken into account. 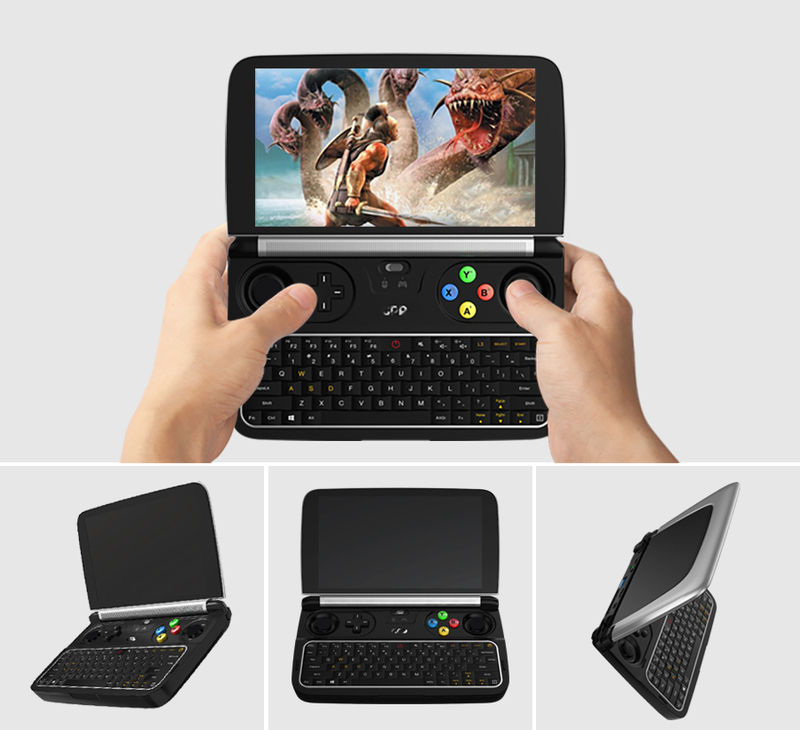 Thus, we have gone through a long product development time to introduce to you a new generation of our product:The GPD WIN 2. Testing resolution: 1280×720. Unless otherwise stated, the game uses low special effects. “World of Warcraft” with an average of 30. The WIN 2 is equipped with a 6-inch touch screen from Sharp Corporation with a viewing angle up to 178 degrees. The screens area has been increased by 9% compared to the previous generation WIN. It also utilizes In-Cell full lamination technology and fourth generation Corning Gorilla Glass. With a screen resolution of 1280×720, it has a ppi 2.53 times greater than that of a typical 24-Inch desktop monitor. The WIN 2 also has a capacitive touch screen. Featuring a seventh generation Intel® Kaby Lake Core™ m3-7Y30 processor, with performance close to that of the Intel® Core™ i7-3770K. With its CPU-Z single- core performance score of 1244 points, there is no stutter running the latest AAA-class games when using low game effects. Complimenting the m3-7y30 CPU cores, the m3-7y30 also features 9th generation Intel® HD Graphics 615 with 24 EU execution units and a maximum dynamic frequency of 900MHz. 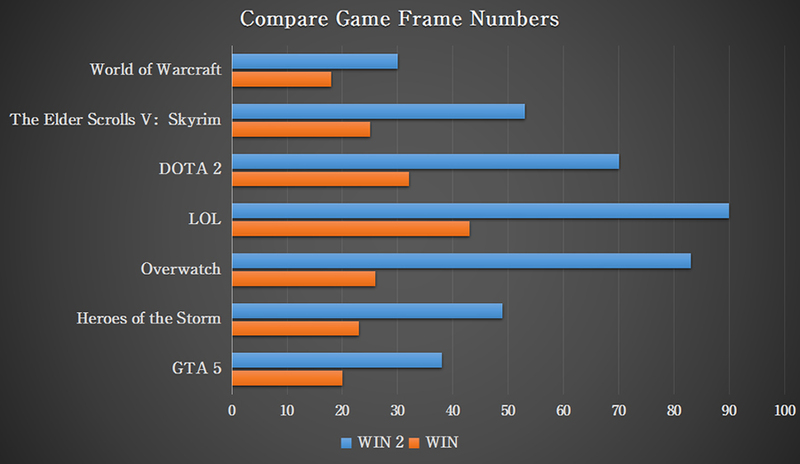 Game frame rates have increased by a factor of 2.2 times compared to the previous generation GPD WIN. Games are smoother and looks more realistic. The device features a M.2 2242 port, with extremely high read/write speed capability. Game loading is 4 times faster compared to a mechanical hard disk or eMMC. Equipped with 2x 4900mAh large-capacity and high-density polymer lithium batteries. 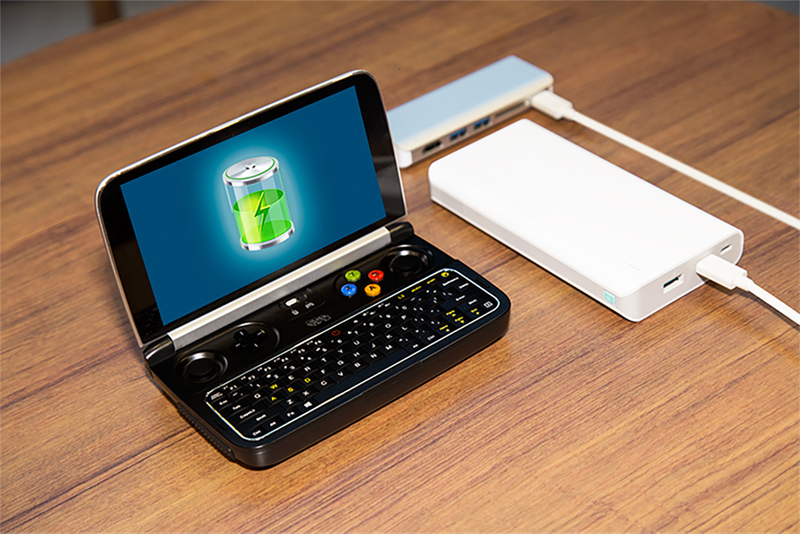 The GPD WIN 2 has a maximum game play battery-life of over 6 hours. Our product is also the first game handheld to support PD 2.0 fast charge, allowing the battery to be charged to half full within 45 minutes. Brand new gamepad design with two 3D joysticks from ALPS Japan. Designed with an innovative PC-class cooling solution, It features a high-power turbofan which can adjust rpm dynamically from 2000 to 8800rpm. When the temperature of the CPU core is between 20-80 degrees, the 60-speed dynamic temperature control will kick in to best balance efficiency. WIN 2 can be charged through mobile power based on PD 2.0 or PD 3.0. At the same time, WIN 2 can also provide the power for your mobile device, such as mobile phone. For a long time, we have thought about how to best design our handhelds in an ergonomic, aesthetic and commercially valued way. We are pleased to announce that the design of the GPD WIN 2 has been done in cooperation between GPD and the Red Dot Award winning design team. We feel the design of the WIN 2 has achieved the best balance of aesthetics, engineering and ergonomics. The frame of the lid is made of light, strong magnesium alloy material to prevent the screen bending. The rounded edge design shows more affinity. 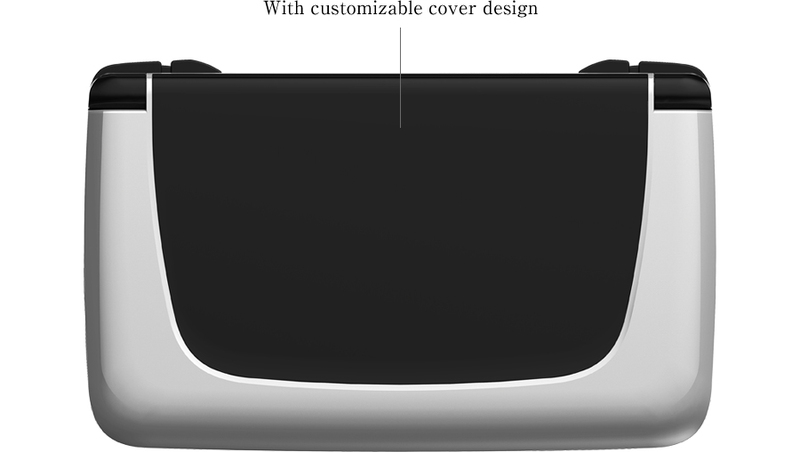 The black removable ABS cover can be replaced with other zinc alloy cover. Alternatively, you can also decorate it with your own metal or adhesive stickers. Enjoy personalizing the style of your GPD WIN 2 to your taste. 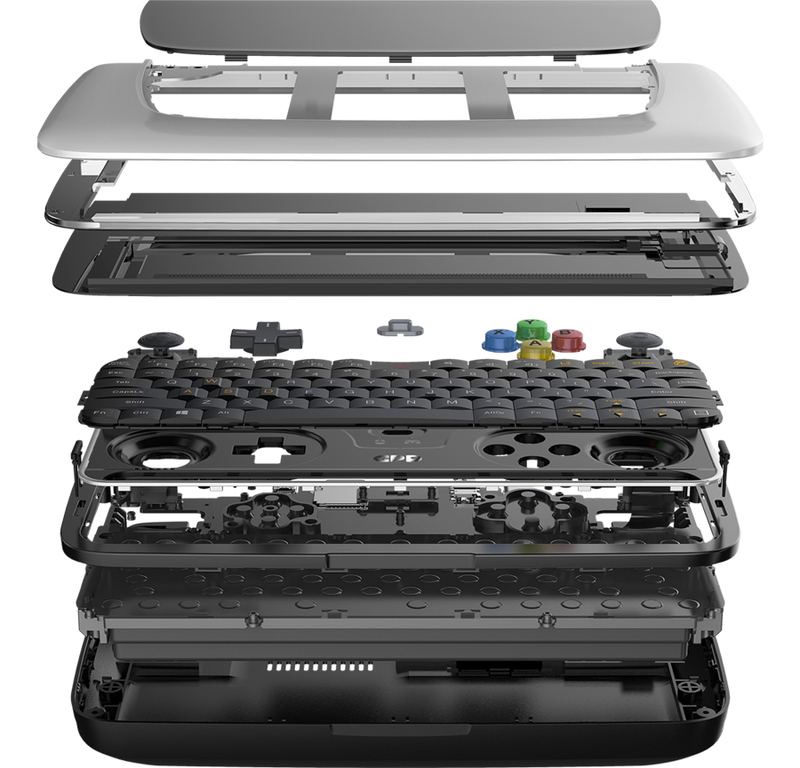 To keep the WIN 2 lightweight, the main body of the WIN 2 uses ABS material. The sunken design of the joysticks allows seamless access to the other game controls. Unique arc metallic film keys, which make it more suitable for blind operation. The 360 style ABXY buttons, still use screen print double-character for their labels. The machine body, keyboard and gamepad use colors which bring out the best of the design. With an elegant matt UV finish, it provides the user with a delicate feel. The machine has been artistically designed with a fine balance of colors and material application. The trigger keys: L1/L2/L3, R1/R2/R3 are situated at the back of the WIN 2 near both corners. The interface ports are also on the back and comprise of: Type C USB, 3.5mm headphone, USB 3.0, Micro SD card slot, Micro HDMI. The hot air outlet is also situated at the rear. The quite compact layout, brings out the best of the design. The bottom surface of the WIN 2 has been designed with a covered slot to enable easy user replacement of the M.2 SSD card. The M.2 SSD card is fixed in place using screws, which effectively guarantees that the SSD is connected with the M.2 interface, even when the WIN 2 is shaken or in the extreme drop state. The design of the air inlet on the side of previous WIN model makes it easier for them to be blocked by hands when holding the machine, which has been widely criticized. This time around, the air inlet of the WIN 2 has been designed in the bottom surface. The fan then forces hot air out the back of the machine. Hot air only travels a short distance before it exits via the back vent, extracting heat from the machine in nearly no time. In limited tests, the temperature of the machine can be controlled at about 39 degrees. Equipped with a 6-inch Super-Shine screen from Sharp Corporation, the viewing area has increased by 9% compared to the previous generation. Using In-Cell full lamination technology, the screen is thinner due to the reduction of a piece of glass. By applying the fourth generation of Corning Gorilla Glass, the intact rate of a 1-meter drop test is as high as 80%, and damage reduction shows a 45% improvement compared to Gorilla Glass 3. Protective design with no prominent frame, allows you to focus on your gaming. Side and upper screen borders have been kept to a minimum, with an upper border of only 5mm and a lower border of only 3mm. The screen resolution is 1280x720, it has a PPI 2.53 times greater than that of a typical 24-Inch desktop monitor. The viewing angle is up to 178 degree. The WIN 2 also has a capacitive touch screen. 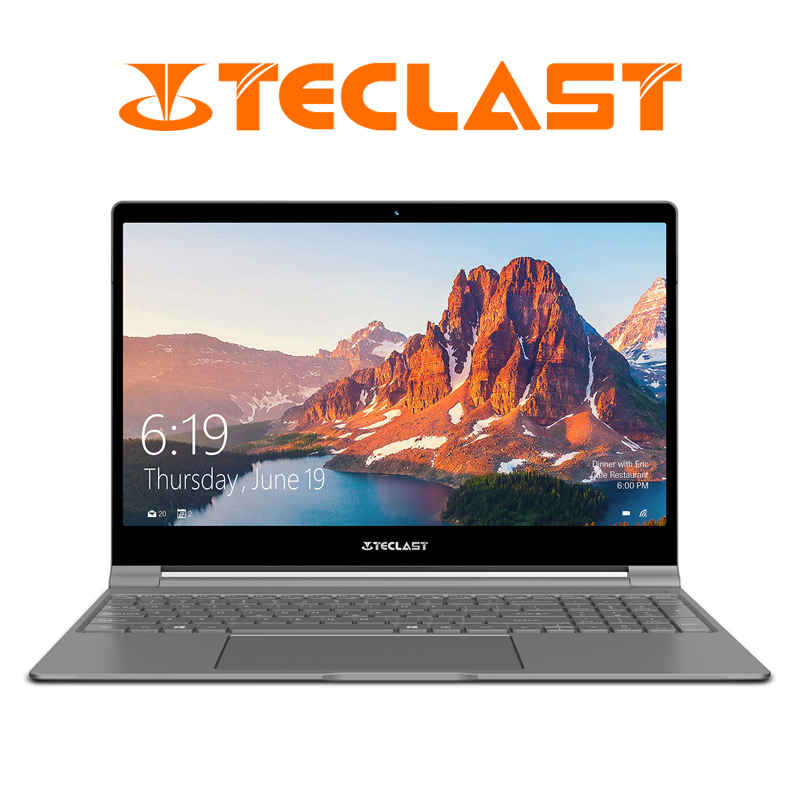 Equipped with the seventh generation ultra-low voltage Intel® Kaby Lake Core™ m3-7Y30 Processor, fabricated using advanced 14nm technology. Under the same power consumption, it can deliver about 12% performance improvement compared to the previous generation Skylake technology. The bus speed of Intel® Core™ m3-7Y30 can reach 99.76MHz, with OPI bus speeds up to 4GT/s and peak data transfer of 4x10^9 times. Together with 4MB L3 cache, it greatly reduces the time to retrieve data from memory. Due to the increased number of transistors and architecture optimizations, the m3-7Y30 is significantly better than the x7-Z8750 used in the previous generation GPD WIN. The improvement in the measured performance of the m3-7y30 is quite obvious. The CPU-Z single-core performance reaches 1244 points, almost 4 times that of the x7-Z8750. Multi-core performance reaches 2688 points, 2 times that of the Z8750. 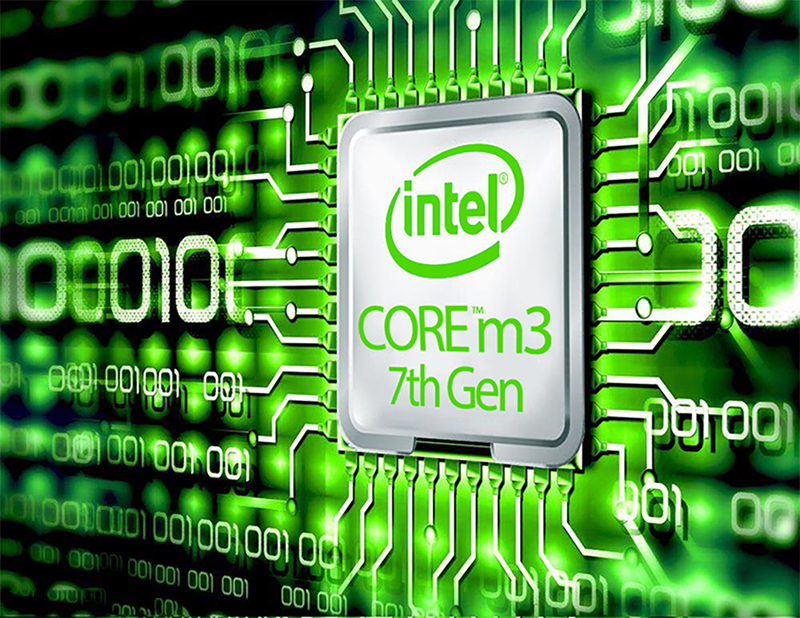 The overall performance is close to the third generation Intel i7-3770K. The emergency response speed of the m3-7y30 has increased significantly thanks to Speed Shift technology which can instantly boost CPU Turbo. Compared to the 0.1 second response time of the m3-6y30, the response time of the m3-7y30 is only 0.005 seconds, killing nearly all the stutters in team battles. Utilizing 9th generation Intel® HD Graphics 615 with 24 execution units (EUs) and a maximum dynamic frequency of 900MHz, the WIN 2 graphics performance surpasses that of its predecessor which uses Intel’s 8th generation HD Graphics 405, with only 16 EUs and a maximum dynamic frequency of only 600MHz. When parallel processing graphics data in a high throughput situation, the HD Graphics 615 performance is up to 220% better than the discrete graphics NVIDIA GeForce GT240. Coupled with the fact that the system resolution is not that high, the WIN 2 can easily cope with the latest AAA games when using low game effects. AIDA64 scores denote the sum of the Read, Write, Copy score. Only PCmark Vantage represents the score of the memory. The m3-7y30 only supports LPDDR3 which has a maximum operating frequency of 1866MHz. Compared to the previous generation of Z8750, the memory frequency has increased by 1.17 times. With dual-channel design, bandwidth up to 128bits, the effective wait time is reduced by 50%, enabling games to run more smoothly. RAM increases to 8GB which is twice as that of previous generation WIN. 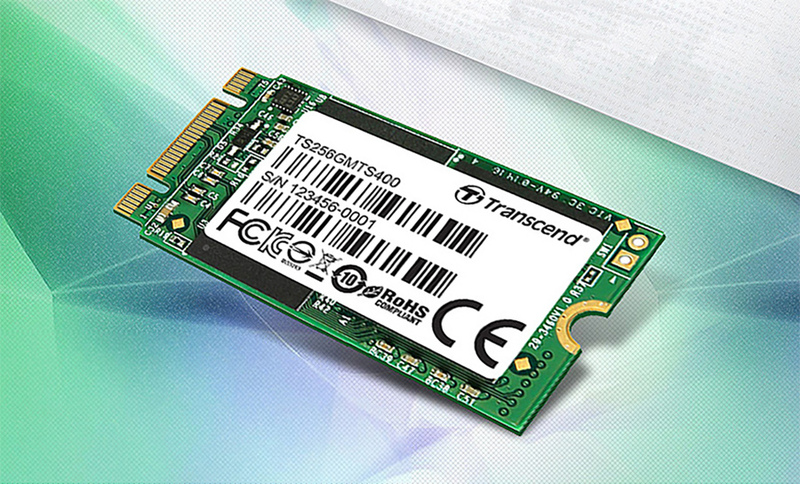 The tested SSD is Transcend / Transcend TS512GMTS400 512GB. Continuous read/write testing is based on CrystalDiskMark for performance evaluation, and the random read and write testing uses CrystalDiskMark QD32 for performance evaluation. The WIN 2 features an M.2 2242 socket interface. It comes standard with a 128GB M.2 SSD. The SSD adopts SATA 3.0 based on the AHCI protocol, which has a theoretical bandwidth of up to 6Gb/s, and a theoretical transfer speed of up to 600MB/s. The M.2 SSD can be easily replaced. Players can buy 256GB, 512GB or higher capacity SSD to replace the original one. There is no capacity limit, which means it can store more games, videos and applications. As an example of SSDs speed, we tested the read speed of the Transcend TS512GMTS400 512GB SSD (which is not the standard SSD in the WIN 2). Read speeds for this card reach 560MB/s, and write speeds reach 460MB/s. This hardware configuration design enables the machine to reach the optimal overall performance of the system, there is no system configuration bottleneck. At the player’s request, the WIN 2 retains the Micro SD card slot. The m3-7y30 supports UHS 104 ultra-high-speed SD interface, and the bus bandwidth is up to 104MB/s, which perfectly supports Micro SDXC cards. The Micro SD card used in the test is SAMSUNG 128GB (model number: MB-MC128D); test software: ATTO Disk Benchmarks V2.47. We performed a speed test using the SAMSUNG 128GB (Model: MB-MC128D) SSD card on the WIN 2. The tests showed read speeds up to 86MB/s, and write speeds up to 55MB/s. These results are 2.04 times better than achieved on the previous generation WIN console, taking full advantage of its bandwidth. The price advantage of Micro SD is quite obvious compared to SSD, and the read/write speed is not lower than that of eMMC. The Micro SD is therefore a powerful complement to the WIN 2 storage options. The above products are the maximum capacity that can be obtained in mainland China, but it does not mean that there is not larger capacity options in other regions. 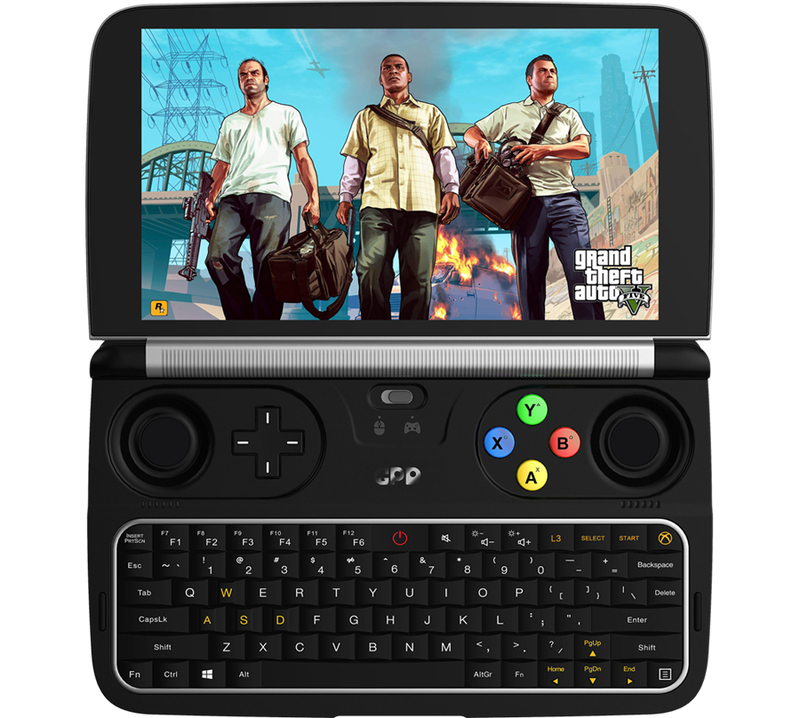 As long as it complies with the interface specification, our GPD WIN 2 can also support the storage. Set the mode switch to X to enter the Xbox 360 gamepad mode. 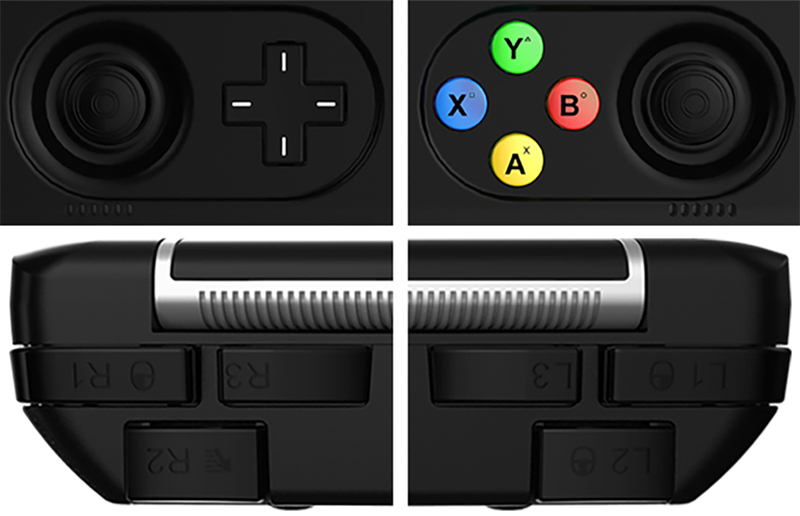 The gamepad still remains the style of WIN, using Japanese ALPS double-3D joystick, with the sunk-style design, which is improved to reduce operational errors. On the left side is a classic cross style D-Pad, which enables fast and accurate directional movement. On the right is the Xbox 360 style action buttons, labeled using a screen print double-character, faster and more accurate with finger touch. L3/R3 trigger buttons are located on the back of the WIN 2 together with L1/R1 and L2/R2. The newly designed trigger buttons make it easy for players to reach the buttons quickly, making the overall gaming experience better. 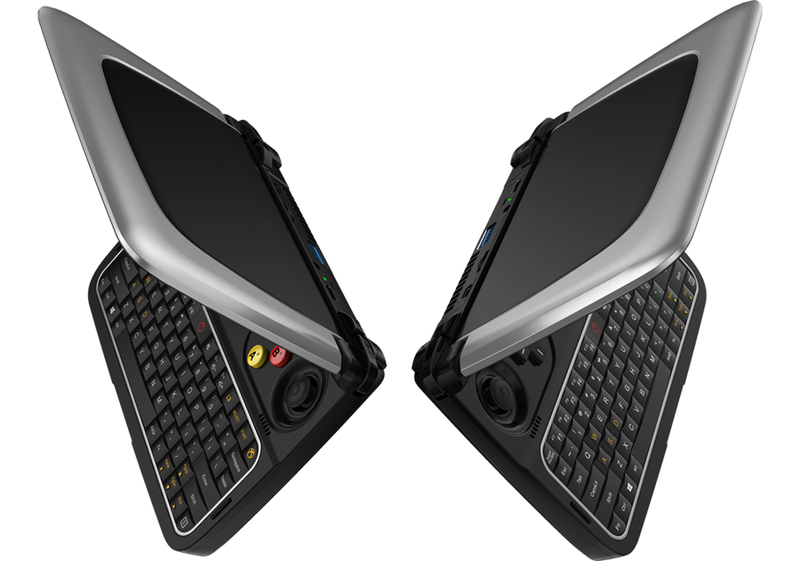 WIN 2 is also equipped with two vibration motors. It’s insane level of vibration effect will help you get more immersed in the game. The two vibrating motors are extremely powerful, providing you with an unsurpassed experience in both racing and shooting games. Each game has a unique and appropriate vibration mode. When playing shooting games, you can feel the recoil of the gun pushing you backward; when starting a car engine, you can feel the vibration of the engine as if you were really sitting in the car. Even the slightest vibration can be sensed, making you more immersed in the game than ever before. The WIN 2 keyboard has been designed to cope with more than 1 million key presses. Key travel has been set to avoid fatigue from long typing sessions. The keyboard has an excellent feel. THE WASD, left, right, up and down keys are designed in a protruding style, which makes PC keyboard gaming easier. The concave power button has been designed to avoid inadvertent presses. In the upper right corner of the keyboard, there is the Xbox key, which can serve as "home button", "screenshot button" etc. When the mode switch is set to the mouse mode, WIN 2 will simulate a mouse using the joystick. Mouse control is important for PC games, as such, the WIN 2 joystick can be used to simulate a mouse. Also, in order to meet the needs of different players, the mouse speed can be increased by pressing the L2 button. If you need faster mouse movement speed, you can press the L2 button to increase the mouse speed by a factor of 2. In order to extend the battery-life, WIN 2 uses 2×4900mAh large-capacity and high-density polymer lithium batteries, with 7.6V output, 37.24Wh of power and 600Wh/L energy density. Its battery capacity is increased by 49% compared to the previous generation WIN, the battery’s power delivery efficiency has been increased from 82% to 95%. The large batteries enable the WIN 2 to deliver an outstanding gaming battery life of over 6 hours. At the same time, our product is also the first game handheld to support PD 2.0 fast charge which can charge the battery to half full within 45 minutes. In addition, the charging logic of the WIN 2 has been changed. 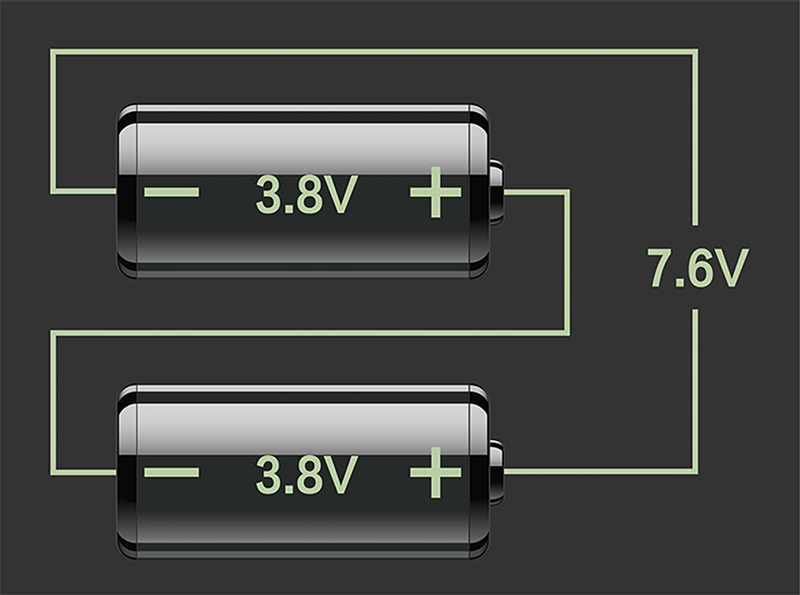 When in charging mode, the motherboard is directly powered by the source supply rather than through the battery. The WIN 2 can support a maximum power supply of 12V/2A. When the power supplied by the charger is not enough to fully power the WIN 2, the battery will supply the power needed in order to ensure better performance and longer runtime of the WIN 2. To enhance the cooling effect, the WIN 2 is designed with a PC-class cooling solution utilizing a high-power turbofan. 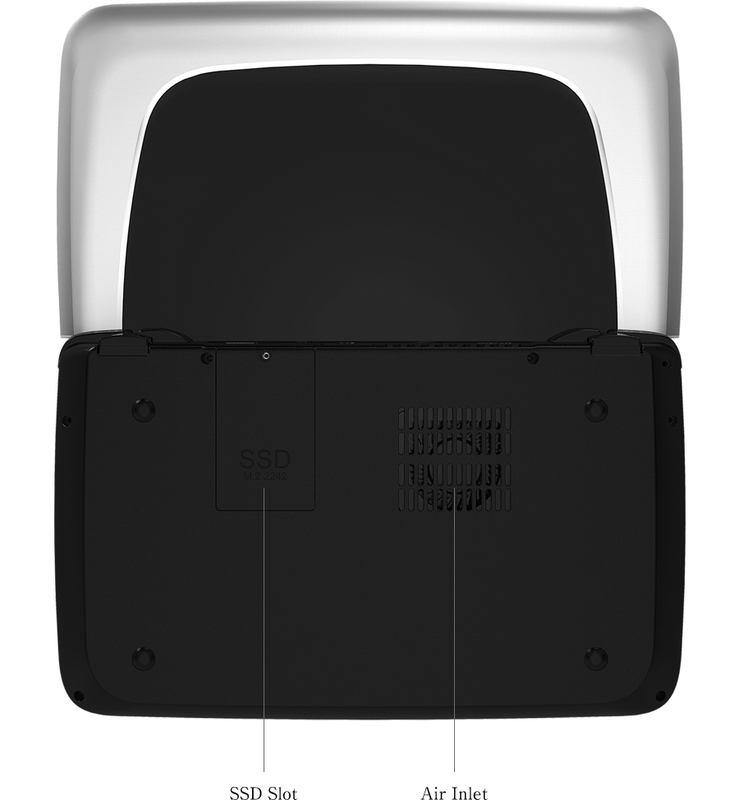 The fan has a dynamic speed ranging from 2000 to 8800rpm. With large-volume side-blown thermal outlet design and ultra-short outlet distance, the hot air exhaust performance is 8 times greater than that of the previous generation WIN. Also the WIN 2 increases the TDP of 4.5W to 15W. When the temperature of the CPU is between 20-80 degrees, the 60-speed dynamic temperature control will be started by BIOS to optimally balance the energy/performance ratio. As for the design of the internal structure, it has benefited from changing the L-type motherboard, to a dual motherboard superposition design. 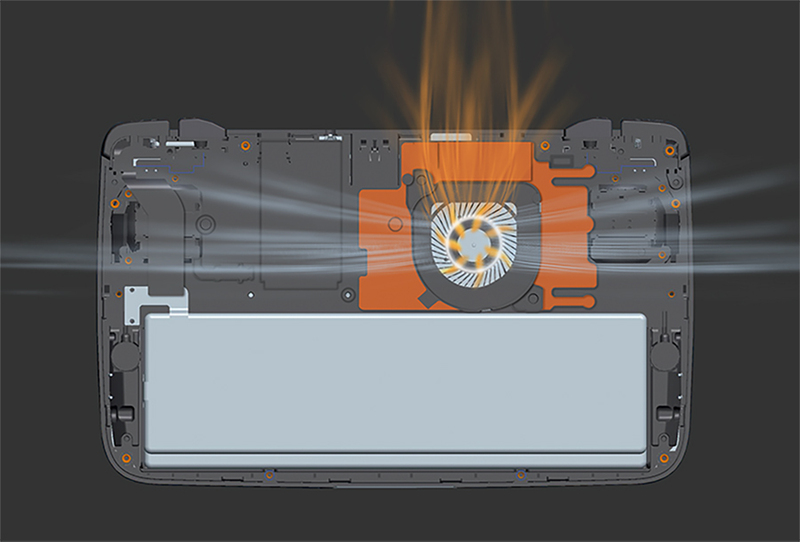 The saved room is used to store the double battery stack, which effectively prevents the conduction of heat between the battery and motherboard. About 6-8 hours, It should depend on the actual working conditions. AB face is magnesium aluminum alloy frame + detachable ABS cover; CD surface is ABS material, whole silver black appearance.